A Chinese cotton wool cleaner, 19th century. Home » A Chinese cotton wool cleaner, 19th century. A Chinese cotton wool cleaner. Our engraving represents an early stage of the latter-the cleaning the cotton-wool, before it passes into the hands of the spinner. As soon as the husbandman in China has got in his harvest-frequently on the very day that he concludes it,- he sows the seed of the cotton-plant. He does this by removing some of the soil with an iron rake, scattering the seed, and then raking the earth over it again. It requires a fall of rain, or dew, to moisten it, it then makes its appearance above ground, shooting up gradually till it attains a height of about two feet. The flowers, commonly of a yellow colour, but sometimes nearly red, appear in August. They are succeeded by pods about the size of a nut, which, opening in three places, about forty days after the first appearance of the flower, discovers in each three or four bags of cotton, exceedingly white, and of the same form as the coil of a silkworm. To the fibres of the cotton are fastened the seeds which are to be sown the next season, and they are separated from the fibre by the following process: A machine is prepared consisting of two cylinders, about a foot long and an inch thick, one of wood, the other of iron, or both of wood. These are so near together that nothing can pass between but the cotton. Being put in motion by means of a foot-wheel, the pods are applied on one side, and the revolution of the cylinders draws in the cotton-wool, which is ejected on the opposite side, while the seeds are struck off, and fall into a receptacle placed underneath. The cotton-wool thus separated from the seed, has to be freed by another process from the knots and dirt which may have accumulated. 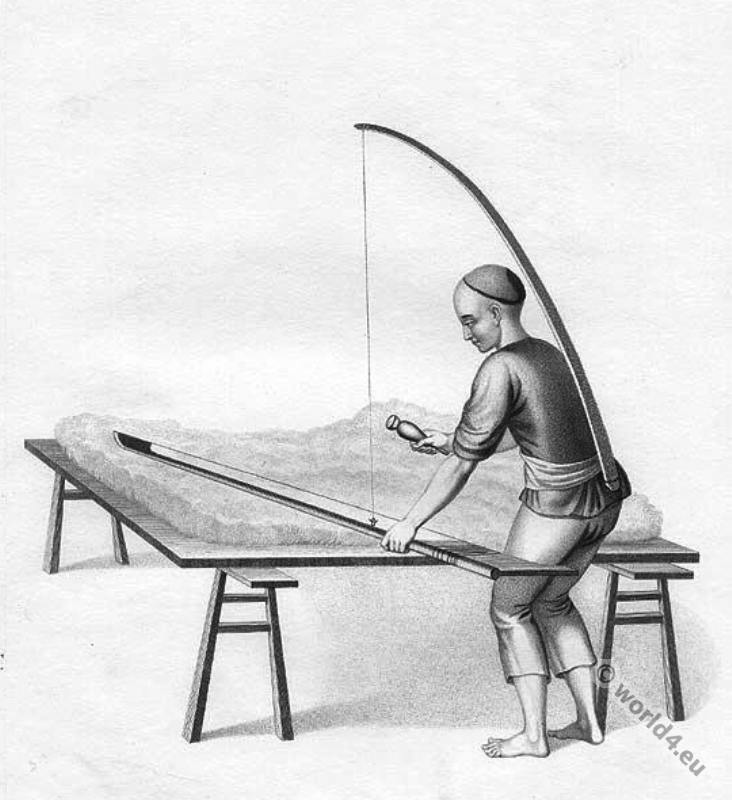 For this purpose, a very elastic bow, with a tight spring, is held by the workman in his left hand, over a heap of cotton-wool. The bow is connected with another string fastened to a bamboo, which is attached to a belt at the back of the man, and passes over his head in a curve. Pulling down the string with some force, over a heap of the cotton-wool, by means of a wooden instrument held in his right hand, he suddenly makes the bow recoil. The vibration thus occasioned is kept up till the heap of wool is entirely scattered and loosened, and separated into fine white flocks, without breaking or otherwise injuring the fibre. It then passes to the spinner. The manufacture of cotton has been known in all ages of the Chinese empire. Marco Polo mentions the Nanking cottons, and their various colored threads- each color being imparted by nature, and not the consequence of a dye. In one of their great works on agriculture, the most minute directions are given for the culture of the cotton-plant, according to the different varieties of soil, climate, &c., and they seem judicious and appropriate. “With the national disposition to make the most of everything, the Chinese, besides manufacturing the cotton produced, express an oil from the seed, and, when the oil is expressed, use the seeds for manure: the capsules or pods being hard and woody, they burn as firewood, and the leaves they give to their cattle; ‘so that/ as the author of the before-mentioned agricultural work observes, ‘ every part of the vegetable is appropriated to some useful object. The cotton manufacture is still one of great importance in China, and the East generally, but not so much so as it was before the inventions of Hawkins, Arkwright, Crompton, Cartwright, and others-aided by the application of steam to manufacturing purposes-enabled the English manufacturer to compete with, and finally to rise superior to, those of China and Hindustan, who had, long before attention was devoted to the production of cotton fabrics in this country, “arrived at such perfection in the arts of spinning and weaving, that the lightness and delicacy of their finest cloths emulated the web of the gossamer, and seemed to set competition at defiance.” Now we supply both China and Hindustan, to a certain extent; and although scarcely three-quarters of a century has elapsed since the British cotton manufacture was in its infancy, it has become, next to agriculture, that which employs the greatest number of hands, in which the largest amount of capital has been invested, and which stands highest in the value both of the domestic consumption and foreign exports. Source: Chinese people at their occupations and applying their crafts. The Costume of China by George Henry Mason published by W. Miller, Old Bond Street, London May 4,1799. Ruins about the Taj Mahal, Agra. Sinhalese boy from Matura, Sri Lanka. A Lama woman. Tibetan frontier. 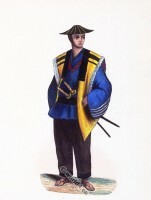 Japanese soldier, 19h century. Soldat Japonais. Russia Kureck woman in 19th century. This entry was posted in 19th Century, Asia, China and tagged Traditional Chinese costumes on 11/26/14 by world4.